Ships 6-8 bus days after proof approval. Pen not included, but we offer discounts if you order pens at the same time that you order this item! Price includes a one-color silkscreened imprint on cover. We can also deboss (press in) your logo for a small additional charge. We can add your logo horizontally or vertically. pen loop (pen not included). We imprint your logo and message on the cover. We silkscreen or deboss your logo on the cover. 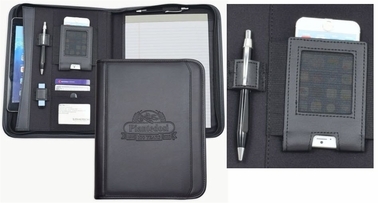 Nicely designed tech padfolio works well as a business gift or giveaway for Millenials in the workforce. When shipped to California this product will be labeled with a Prop 65 warning message.